As well as being a great way to promote our business and affirm our name within the city, the sponsorship deal also demonstrates our commitment to supporting local business, and what better way to do that, than with your home town football club! The football club shares our passion for success and continuous improvement and has very prominent family values that are important to us in our business too meaning that the synergy between our company and the club is not just down to location. 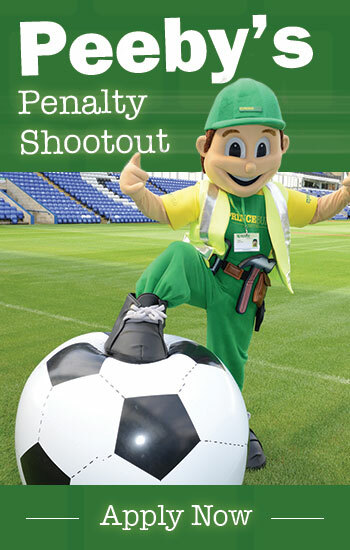 We introduced Peeby’s Penalty Shootout Competition in 2015 which gives you the chance to win £50.00 worth of vouchers to spend in Peterborough United’s Club Shop. So, if you fancy taking up the challenge of kicking a huge ball and scoring a half time penalty against Peeby, our friendly Company Mascot, just click on the link and send us your details.